Graham, they will eat the fruits... also fallen figs... but... can cause vastly accelerated fermentation: high in sugars, carbohydrates, etc. I have seen them eat them in Morocco (as well as here), but we need to remember Opuntia is an introduced (non-native) species, so just because they like it does not indicate it is part of their "natural diet". I'm waaaaayyyy confused with everything regarding my sulcata's diet. I'm trying everything imaginable and each time I do, there's another article and/or post saying otherwise. Feed this - not that. Is there something simple enough (other than the orchard grass) which can be fed daily and taking the stress out of what may cause "this or that" to his health? I'd like for someone to be more specific about what "excess" means. Once per week, month? How are we to assume what "feed in moderation" means? Will someone PLEASE tell me what I can feed on a DAILY basis? What I should feed 3x per week? How often to feed opuntia? Mulberry leaves? I have them redily available, now I'm hearing something else. Thank you ANYONE who comes to my rescue with an answer. The information there is reliable and easy to follow. Complete newbie, your patience is appreciated! Although I understand when "special treats" apparently means once per week (according to the site you've led me to), how much does 25% of a diet mean? Three times per week? I'd like to get this right once and for all. I've tried the collards and bok choy - of course ALWAYS added with orchard grass. He HATES both, so I move on to the next taste test. So far, the only thing he appears to like is the supermarket organic spring mix the most and dandelion. Although, I haven't and won't give up trying. It simply means approximately 1/4 of the daily/weekly/monthly intake. It really is not that critical. It's just a guide. If you avoid the bad mistakes (for example as listed in our article: http://www.tortoisetrust.org/articles/webdiet.htm) you will be fine. I would not get too concerned with small details. Just get it in the ballpark. You are not going to replicate exactly a wild sulcata diet.. just as UK keepers cannot replicate a wild T. graeca diet. Just avoid the really bad stuff (especially regularly) and keep an eye on growth. If the growth is nice and smooth, and there are no digestive problems, you are doing OK.
Graham Ray wrote: As this topic is about wild foods etc. 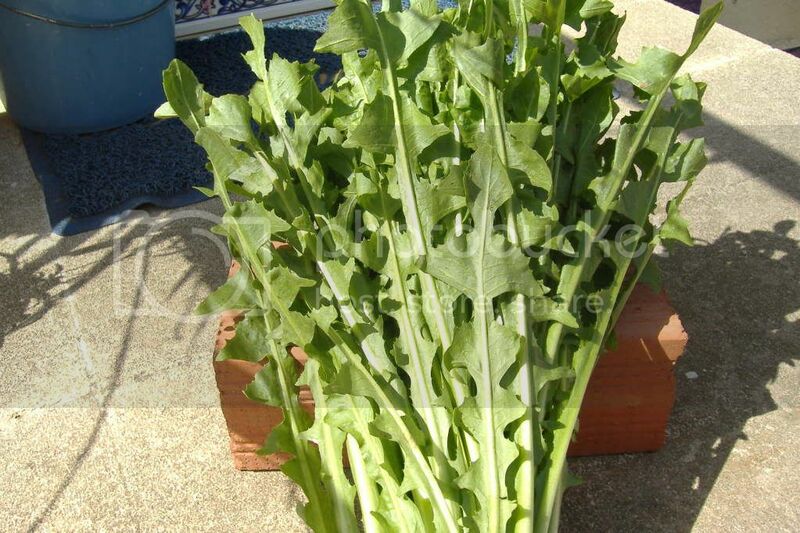 I wonder if anyone could identify this plant which is sold on the vegetable stalls in the area of Spain where I live?? The tortoises do eat it readily but I am wondering if it is OK to feed. Personally, I think it may be cultivated Dandelion. It costs anything from 10 to 35 cents per bunch. It's a type of chicory. Is there a data base for plants/weeds available here in S Spain for torts? I refer to TTT but many of the plants here are not listed.